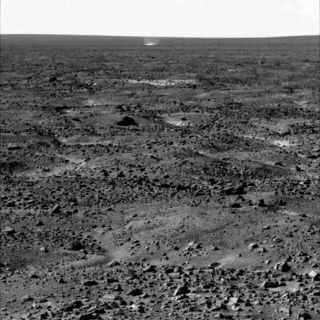 The Surface Stereo Imager on NASA's Phoenix Mars Lander caught this dust devil in action west of the lander at 11:49 a.m. local Mars time on Sol 104, or the 104th Martian day of the mission, Sept. 9, 2008. The dust devil visible in the center of this image just below the horizon is estimated to be about 400 meters (about 1,300 feet) from Phoenix, and 4 meters (13 feet) in diameter. Dust devils raging across the arctic plains of Mars werecaught on film by NASA's Phoenix Mars Lander. Phoenix captured images of at least six different dustdevils that danced across the planet's surface last week, and sensed a dip inair pressure as one passed near the lander. These whirlwinds, which are somewhat like gentle tornadoesand are common in the American Southwest, too, had been expected in Phoenix'slanding site near the north pole (they've been seen from above by orbitingspacecraft) but not confirmed by the spacecraft until now. Dust devils are whirlwinds that often occur when the Sunheats the surface of Mars (this also happens in some areas on Earth). Thewarmed surface heats the layer of atmosphere closest to it, and the warm airrises in a whirling motion, stirring dust up from the surface and whisking ithigh into the air. They have been photographed by the Mars rovers operatingnear the equator, too. Phoenix's Surface Stereo Imager camera took 29 images of thewestern and southwestern horizon on Sept. 8, during mid-day hours of the lander's104th Martian day. When the Phoenix science team analyzed the images the nextday, they noticed a dust devil immediately. "It was a surprise to have a dust devil so visible thatit stood with just the normal processing we do," said Mark Lemmon of TexasA&M University, College Station, lead scientist for the stereo camera. "Once we saw a couple that way, we did some additional processing andfound there are dust devils in 12 of the images." The dust devils seen range in diameter from about 2 meters(7 feet) to about 5 meters (16 feet). "It will be very interesting to watch over the nextdays and weeks to see if there are lots of dust devils or if this was anisolated event," Lemmon said. The day the camera saw dust devils, Phoenix's pressure meterrecorded a sharp dip in the thin atmosphere. The drop was less than the overalldaily change in air pressure from daytime to nighttime, but this dip occurred overa much shorter time. "Throughout the mission, we have been detecting vortexstructures that lower the pressure for 20 to 30 seconds during the middle partof the day," said Peter Taylor of York University in Toronto, Canada, amember of the Phoenix science team. "In the last few weeks, we've seen theintensity increasing, and now these vortices appear to have become strongenough to pick up dust." Still, the dust devils observed by Phoenix are much smallerthan those seen closer to the planet's mid-section by NASA's Mars ExplorationRover Spirit. "We expected dust devils, but we are not sure howfrequently," said Phoenix Project Scientist Leslie Tamppari of NASA's JetPropulsion Laboratory, in Pasadena, Calif. "It could be they are rare andPhoenix got lucky. We'll keep looking for dust devils at the Phoenix site tosee if they are common or not."